• A hard copy of Geshe Sopa’s autobiography, Like a Waking Dream, signed by Yangsi Rinpoche. Geshe Ngawang Gendun, Yangsi Rinpoche’s previous incarnation, was one of Geshe-la’s principal teachers and there is a beautiful photo of Geshe Ngawang Gendun in the book. • A mala blessed by Yangsi Rinpoche. 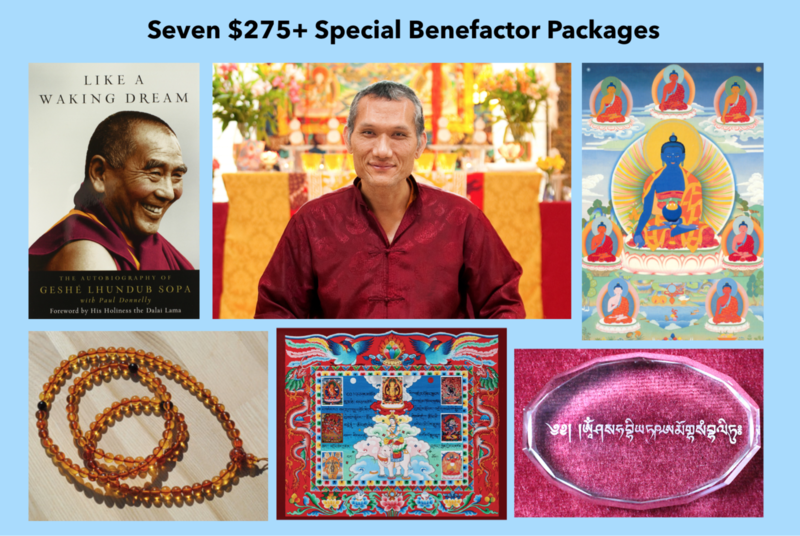 • And we will offer a special Medicine Buddha puja dedicated to our benefactors & their loved ones with Ven. Gyalten Palmo when she is here as our Teacher in Residence in December.